Granbury is bursting with vibrant artists and talent throughout the community. The Historic Granbury Square is an easy drive from the Dallas/Fort Worth Metroplex and is a popular destination for day trips and weekend getaways, so it is the perfect location for the Harvest Moon Festival of the Arts. This family friendly art festival will be held on the paved area around the charming Historic Granbury Square in the heart of the historic district. This year&apos;s festival will be held October 19-20, 2019. The 40th annual Harvest Moon Festival event is put on by both the Historic Granbury Merchants Association and the Granbury Arts Alliance. This long running festival showcases over 80 artists, makers and craftspeople. You’ll find to food, local entertainment and seasonal activities and all surrounded by the most vibrant historic square in Texas. This unique festival is always a hit! 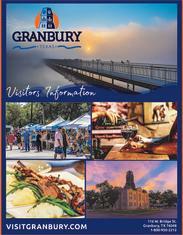 Grab your friends and head to Granbury this October for your getaway. Artists can apply to be a vendor here.